So friendly staff. Very clean room. Support us to take upgrade for a few rate. Location. Excellent friendly staff. Excellent breakfast. Apartment cleaned exceptionally well every day. Clean towels and linen. Great location, close to beach and many restaurants. Highly recommend. Will go back. Apt was huge and clean, view from it was quite good, but in Dubai it is quite difficult to have open view because buildings are everywhere. Staff was extremely helpful. Location is also really good. Very clean and excellent location the apartment was very big and nice view and furnitures. The rooms is very large and the beds is comfortable they breakfast is fantastic with alot of variety of food and room service is fast as soon as we call they comes and location is great. Clean, quiet, staff, and location. The place is family friendly, smoking free, and clean. Location is the best. When it comes to staff, they were super nice! Helpful and attentive. John on check-in then Zainab at checkout were very professional. Free valet parking is a nice touch especially I am travelling with family. The apartment is clean, have all things ready. Room service kept the place very tidy even if it is late on the day. The place is quiet and the people are attentive to needs and respond quickly. There was a problem with fridge and by the time we came back it was replaced no questions asked. To sum up all things together, I really recommend the place for families with children on every aspect. I will consider it always ! Lock in a great price for JA Oasis Beach Tower Apartments – rated 8.6 by recent guests! 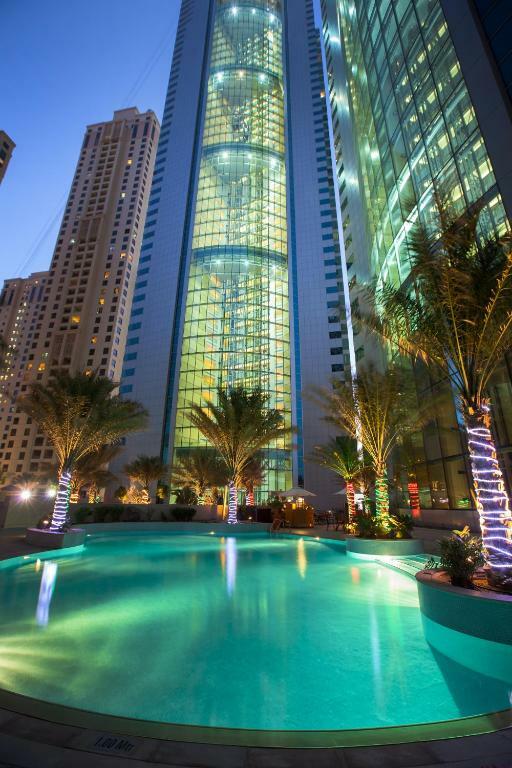 One of our top picks in Dubai.Located on Dubai’s famous The Walk on Jumeirah Beach Residence just steps away from Jumeirah beach, with endless shopping, dining and leisure facilities. JA Oasis Beach Tower is ideally located offering panoramic views of the Arabian Gulf, two outdoor swimming pools and 180 spacious luxury apartments. The spacious serviced apartments all include a living room, floor to ceiling windows, fully equipped kitchen, air conditioning, free WiFi and 2, 3 or 4 bedrooms with their own flat-screen TVs and private bathrooms. Thyme restaurant conveniently located on the 1st floor, serves Mediterranean cuisine from live cooking stations for breakfast, lunch and dinner. Alternatively, we offer 24-hour in room dining. Stroll along The Walk promenade to find other casual eating spots, a cinema and outdoor markets. There are 2 outdoor swimming pools with sun decks, a hot tub and water slide. The fully equipped gym includes a sauna and a steam room. ChillZone offers some games for kids from 8-16 years. Excursions can be arranged by the concierge. Guests also enjoy complimentary access to JA Jebel Ali Golf Resort's private beach, where a free shuttle bus service is provided. Apart from the beach, JA Oasis Beach Tower is close to golf courses and water parks, with a free shuttle to some shopping malls. The property is about 10 minutes from Emirates Golf Club and Ibn Battuta Mall, while Mall of the Emirates and Ski Dubai are approximately 15 minutes away by car. Dubai Parks and resorts and other theme parks can be reached in 25 minutes. 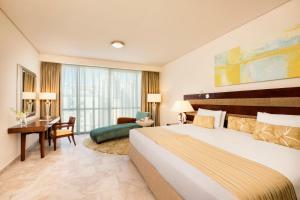 When would you like to stay at JA Oasis Beach Tower Apartments? These spacious apartments are located on the higher floors 15 to 32 (with balconies) and 42 to 49 (without balconies) offering marina and sea views. Two bedrooms with attached bathroom include a master bedroom with a walk-in wardrobe, plus separate bath and shower and the accommodations also has a maid’s room that can also be used as a nursery. These spacious apartments are located on higher floors 15 to 32 (with balconies) and 42 to 49 (without balconies) and dazzling gulf views. Three bedrooms with attached bathroom, a master bedroom with a walk-in wardrobe, separate bath and shower, guest toilet, maid’s room, plus additional storage space are the highlights of this stylish contemporary apartment. The incredibly spacious apartments are located on the higher floors 15 to 32 (with balconies) and 42 to 49 (without balconies) offering views of the ocean and Palm Jumeirah. Four bedrooms with attached bathroom include a master bedroom with a walk-in wardrobe, plus separate bath and shower and the accommodations also has a maid’s room that can also be used as a nursery. 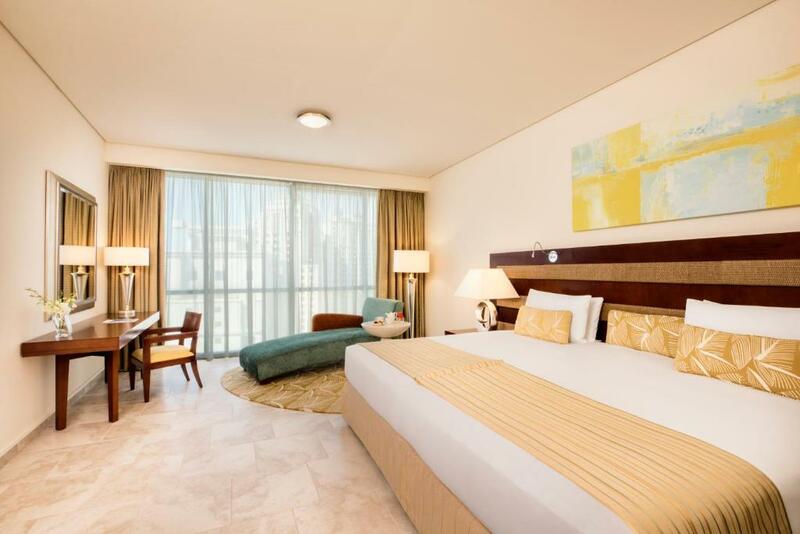 These spacious apartments are located on floors 4 to 14 with picturesque views of Dubai Marina and the sea, with a balcony, separate living/dining area and stylish contemporary décor. Two bedrooms with attached bathroom include a master bedroom with a walk-in wardrobe, plus separate bath and shower and the accommodations also has a guest toilet and maid’s room for additional storage. These spacious apartments are located on floors 4 to 14 with a balcony and dazzling sea views. Three bedrooms with attached bathroom include a master bedroom with a walk-in wardrobe, plus separate bath and shower and the accommodations also has a guest toilet, maid’s room, plus additional storage space. Stylish contemporary décor sets the scene for a relaxing Dubai Marina stay. Located on floors 4 to 14 with impressive views of Palm Jumeirah, the accommodations features a living area with large dining space. Four bedrooms with attached bathroom include a master bedroom with a walk-in wardrobe, plus separate bath and shower and there is also a guest toilet and maid’s room for additional storage space. These spacious Two-Bedroom Premium Apartments are located on the highest floors 33 to 41 with balconies offering marina and sea views. Two bedrooms with attached bathroom include a master bedroom with a walk-in wardrobe, plus separate bath and shower and the accommodations also has a maid’s room. Take advantage of Premium Club benefits with lots of little luxuries to enhance your stay. 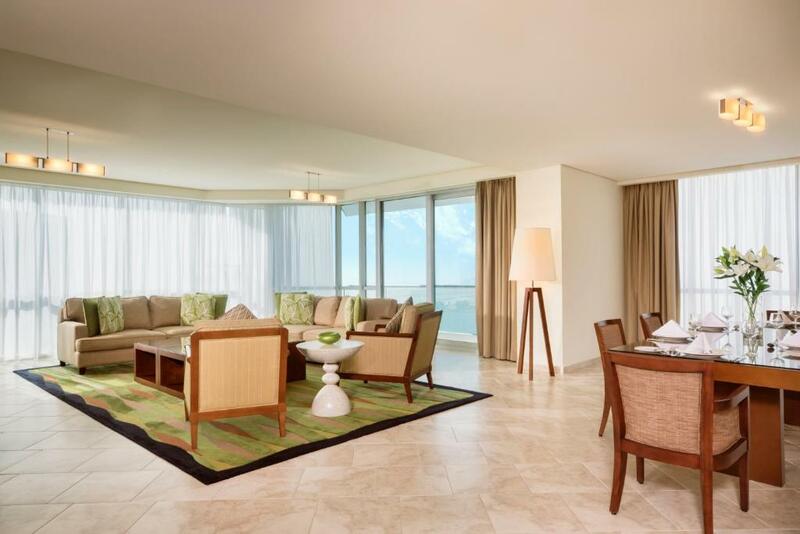 These spacious apartments are located on the highest floors 33 to 41 with sea view balconies. Three bedrooms with attached bathroom include a master bedroom with a walk-in wardrobe, plus separate bath and shower and the accommodations also has a maid’s room that can be used as a nursery, a guest toilet and separate storage space. Premium Club benefits add little luxuries to enhance your stay. 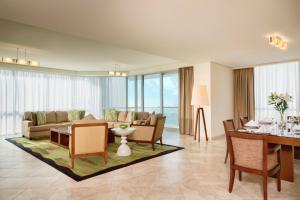 The generous four-bedroom options are located on the highest floors 33 to 41 with sea view balconies. Four bedrooms with attached bathroom include a master bedroom with a walk-in wardrobe, plus separate bath and shower. A maid’s room can be used as a nursery or for extra storage space and Premium Club benefits are included. These spacious apartments are located on floors 4 to 14 (with balconies) offering marina and sea views. One-bedroom suites include a master bedroom with a walk-in wardrobe, plus separate bath and shower. 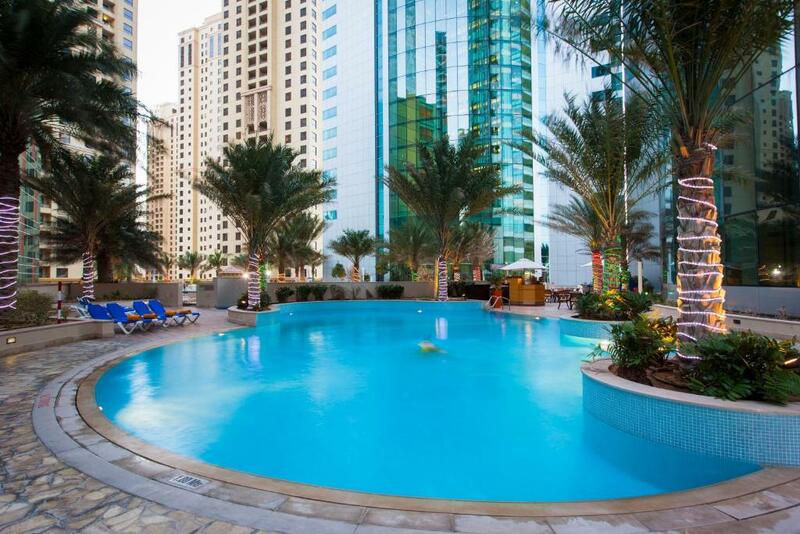 JA Oasis Beach Tower is a stunning 5-star property enjoying an outstanding location on the world-famous Jumeirah Beach in the heart of New Dubai, offering easy access to the metro station and major attractions such as the Walk and The Beach Mall. Extending warm welcome, an infinite array of words can be summoned to effectively describe the modern appeal of this luminously extensive residence. With such stately exuberance, JA Oasis Beach Tower is an obvious choice for those wishing to relax. 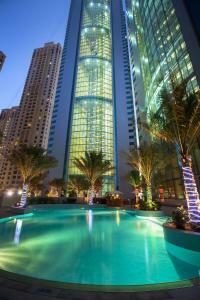 The Walk is a bustling waterfront promenade in the heart of Jumeirah Beach Residences (JBR). It has become a favorite spot for tourists and residents alike, and is continuously growing its offering that attracts people from all ages and tastes. It is one of the top locations to experience Dubai, with its sandy beach, international restaurants and shopping promenade. The Walk also boosts a range of entertainment options for the entire family, be it live street art performances, a skate park for the kids or many of the pop-up outdoor events and topping it off with the first outdoor Cinema. Kids and adults also have the privilege of the water park where they can enjoy floating fun in the middle of the sea! House Rules JA Oasis Beach Tower Apartments takes special requests – add in the next step! A AED1500 damage deposit is required on arrival (around USD408.37). This deposit will be fully refunded at check-out, as long as there isn't any damage to the property. JA Oasis Beach Tower Apartments accepts these cards and reserves the right to temporarily hold an amount prior to arrival. The credit card used for the booking must be under the name of one of the guests staying and the same card must be presented for verification upon check-in. If the guest staying is not the cardholder or the credit card used cannot be produced at the time of check-in, the guest has to pay for the booking in cash or by alternate credit card. The hotel reserves the right to reject the booking due to noncompliance of the requirements. Please note that all the apartments are nonsmoking, however smoking can per permitted in the balcony in case apartment has a balcony. Please note that for flexible rates, the hotel reserves the right to pre-authorize the credit card anytime after the booking is made. Thyme Restaurant will be undergoing a venue refurbishment through April to July 2019. During the renovation, breakfast will be served at our Sky Lounge. For more information contact the property directly. A damage deposit of AED 1500 is required on arrival. That's about 408.37USD. This will be collected as a cash payment. You should be reimbursed on check-out. Your deposit will be refunded in full, in cash, subject to an inspection of the property. Room service takes hour , checking in waited in lobby 1 hour 30 mins to go in my apartment. Luggage picking up took so long . Maybe they need more staff / workers to make it faster . Everything was excellent, I’d definitely stay here again. The staff were amazing and helpful and Mohammed went the extra mile to make it special for us. Thankyou so much. Great location and the most luxurious apartments! The pool is very cold, in shade most of the day which doesn't help but the water should be heated. The location is excellent and room was very clean with great views. Very spacious even with 8 of staying there.